A.B. Stokes, a Chicago native, earned first team all-conference at wide receiver for Sterling College in 2006. Stokes played for Smith Center alum and longtime Sterling coach Andy Lambert. Then, Stokes coached for Lambert for two seasons. Three years ago, Stokes took over the Larned middle school program. The Indian high school program has long struggled with no playoff berths since 1985 and, according to Stokes, no winning seasons since 1998. Coach Al Troyer, now successful at Tonganoxie, left after the 2012 season when Larned had a 24-game losing streak. Even with the losses, Stokes noticed some positives when he watched the high school during his year with the junior high. “They were very coachable and were well-mannered and eager to listen and learn,” Stokes said. “I could tell that they really wanted it to be good. That's where it starts. You have got to want something." 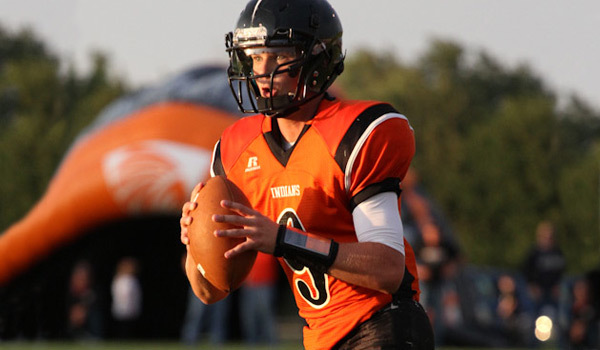 Last fall, Stokes took over Larned and quickly led the Indians to a 3-0 start with a 27-25 victory against Ellsworth, a 15-point win against Ellinwood and a 10-point victory versus Thomas More Prep-Marian. Larned lost its final six games, all but one by at least 36 points. A year later, Stokes has continued to build the program. Larned is again 3-0 against the same teams. However, led by senior quarterback Easton Palmer, the Indians have bigger margins of victory. The Indians defeated Ellsworth 37-29, beat Ellinwood 60-0 and defeated an improved and experienced TMP team on the road, 41-8. "We are big on minimizing the gaps between potential and performance,” Stokes said. “If you didn't know any better, you would call us Sterling College High School. I definitely learned a lot from Andy Lambert. He is my mentor as a coach, and I still have a close relationship with him today. He still helps me today with some of my decision-making, and things that I can do to make the program better." Several of Stokes’ assistants played at Sterling, including defensive coordinator Austin Kingsbury, a great high school player who helped Smith Center start its run of five straight state titles. "He is probably my favorite coach,” Palmer said. “He is a pretty cool guy. He is young and pretty relatable. It's easy to get along with those guys." On Friday, Larned plays Ellis, a program that saw its run of six straight district crowns and nine straight playoff berths end last fall. “We feel like that Ellis was a turning point last year in the season,” Palmer said. “We feel like it is kind of a turning point. We want to show everybody that it is not a game anymore. We are not playing around." The Railroaders (1-2) are a young team, especially at some skill positions. Stokes’ foundation came in the weight room. Even with last season’s strong start, Stokes said the players “didn’t really know to trust” yet. The players hadn’t seen many gains entering 2012. This summer, though, Stokes had his second year with the high schoolers. The team did well at padded camp at Ottawa University and 7-on-7 in Manhattan and Larned. Stokes said players had “some tremendous” weight room numbers. “It is just a little bit more faith this year than it was last year,” Stokes said. Stokes has changed the culture with his attitude, too. “Just the mental part of the game,” Palmer said. “He has really just changed the mindset around. Just believing in yourself and being positive and happy more for your teammates than you are for yourself." Palmer, who passed for 278 yards and accounted for four scores (three passing) against TMP, is a state runner-up in powerlifting, an all-state baseball player and was honorable mention all-league offense last season. “Coach A.B. always tells me, "You've got to be a superhero,’” Palmer said. Palmer has improved in reading defenses; Stokes said the signal-caller spends around six or seven hours a week in film study. “He understands the offense a lot better, and he knows what we are trying to do,” Stokes said. In addition to Palmer, several other Indians have played well. Stokes named senior Seth Hutchins (6-3, 210) and Kaiden Reed (6-1, 255) as anchors of the lines. "They are smart,” Palmer said of his line. “They know what they are doing. They know what they are supposed to do and they do it well and hard." Senior Brayden Smith had 124 receiving yards against TMP, part of eight passing plays that went for at least 12 yards. Senior Grant Unruh has played well at wide receiver and senior Jamil Shoemaker has been solid in the backfield for the improving Indians. The Indians have already scored 138 points after it scored 140 in 2012. "Our defense has stepped up a lot, and our offense is a high-powered offense, and I feel like we can score at will,” Palmer said.